Another giant JRPG is out for the Wii U today. Is Atlus and Nintendo’s mash-up of Shin Megami Tensei and Fire Emblem any good? We’ve got positive impressions of the Japanese version of the game and video of the first hour of the Western version to help you decide. Like many Shin Megami Tensei games, Shin Megami Tensei X Fire Emblem is set in modern day Tokyo. The story follows Itsuki, a normal high schooler. After school one day, he goes to watch a singing competition—only to discover that his class mate Tsubasa is a finalist. Suddenly, all hell breaks loose as ghost figures appear and begin stealing energy from the gathered crowd while Tsubasa is dragged through a mysterious portal. Chasing after her, Itsuki is able to turn one of the specters, Chrom, to his side and the two merge to rescue Tsubasa. After this, the two (along with Tsubasa and her own partner) join talent agency Fortuna Entertainment—the front for an organization that uses pairs like Itsuki and Chrom to stop these otherworldly incursions before people’s energy is sucked dry. The game is not just a mash-up of two popular RPG franchises but an RPG take on modern Japanese pop culture. It plays more like an SMT game, but with FE character designs used during battle scenes. Richard’s import preview explains how the game works, so give it a read. His takeaway? 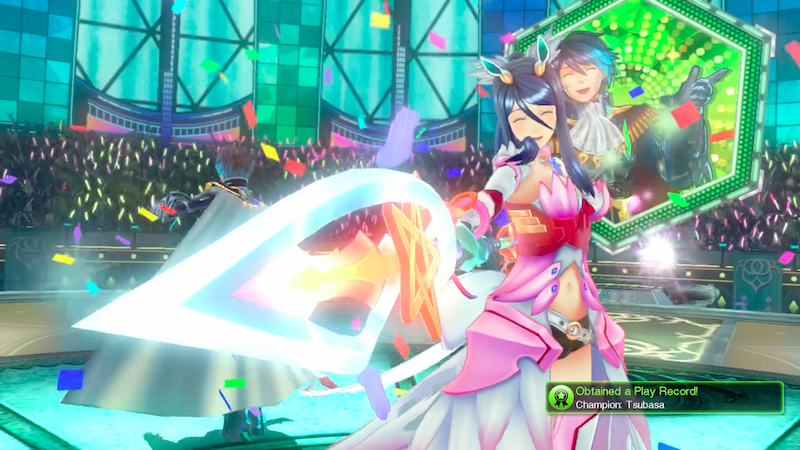 If you are expecting a dark and brooding game, you’re not going to get it in Shin Megami Tensei X Fire Emblem. While there is good character drama and a few darker moments, it is largely a light-hearted adventure set in the Japanese entertainment world. The gameplay is challenging and the characters a ton of fun to get to know. So while it might not be exactly what you pictured for Shin Megami Tensei X Fire Emblem, it’s certainly an RPG worth playing whether you’re a fan of either series or not. Yep, this is an RPG. Plenty of stats to level up. The graphics for when you’re running around looking for an enemy to trigger your next battle encounter? Not so amazing. The main twist to the battle system involves identifying an enemy’s weakness and attacking with the corresponding move that then chains allies with related moves to join in for a “session” attack. As you battle, the Fire Emblem spirits who’ve transformed our young heroes imbue their weapons with new skills. This screen will eventually fill up with the characters in your party.